Among the many iconic cities of the United States, San Diego, California is one of the most beautiful. Situated on the Pacific Coast in the county by the same name, San Diego possesses such a long list of remarkable amenities and features, it is not at all surprising so many luxury home buyers in Southern California choose it as their new address. Whether looking for a bungalow, cape cod, a Contemporary, Mediterranean, European or Spanish style home, oceanfront property, a luxury condo or townhouse, you can find a multitude modern, elegant and spacious homes from which to choose in San Diego. This extraordinary city is known, not only for its exquisite luxury real estate market, but for its technological developments, being a leader in scientific innovation, and for its rich arts culture. For people working in the science, IT or arts industries, San Diego is the perfect address, and it is home to both the Strategic Operations and Pixel film studios. The city is also home to numerous aquatic clubs and programs, including the Mission Bay Aquatic Program, which hosts tens of thousands of participants annually. The 4,600 acres around Mission Bay Park, along with seventeen miles of coastline, afford San Diego residents and visitors alike, an abundance of recreation opportunities. The gorgeous beaches are among the area’s major attractions and there are permanent lifeguard stations located at Black’s Beach, La Jolla Shores, Ocean Beach, Mission Beach, South Mission Beach, Pacific Beach, North Pacific Beach and Children’s Pool. There are also dozens of seasonal stations that operate during the summer at those beaches as well as at Mission Bay Beach, Windansea Beach and La Jolla Cove. It is easy to enjoy the area’s beaches and numerous other outdoor destinations because of the moderate climate. Snow is not common here, except in the mountains of East County, and on most days any cloud cover dissipates early giving way to beautiful blue skies. 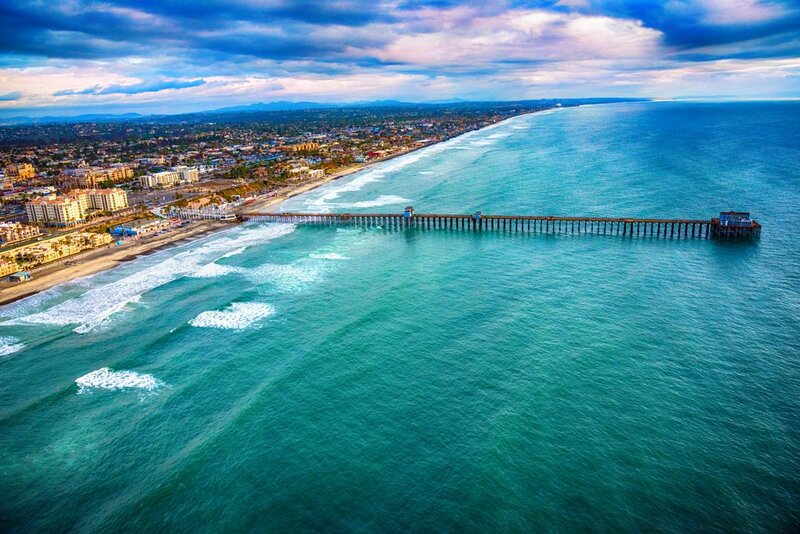 However, the gorgeous beaches and delightful weather are just a few of the advantages of calling San Diego home. There are even more opportunities to enjoy water activities like boating, fishing and waterfowl hunting, as well as seasonal activities like windsurfing, jet skiing and water-skiing at the many city lakes. The San Diego city lakes are actually part of the municipal water-supply system but the city has offered recreational use of its impounding reservoirs since 1913. Reservoirs affording recreation opportunities include Barrett, El Capitan, Hodges, Lower Otay, Upper Otay, Miramar, Morena, Murray, San Vincente and Sutherland reservoirs. Furthermore, this diverse city has over fifty-five recreation centers and thirteen swimming pools, as well as five skate parks: Robb Field Skate Park, Rancho Penasquitos Skate Park, Charles L. Lewis Skate Park, Carmel Valley Skate Park and Bill and Maxine Wilson Skate Park. San Diego is also home to three municipal golf courses, Mission Bay, Balboa Park and Torrey Pine Golf Course. And on top of all of that, there are almost 40,000 acres of developed and undeveloped open space, and over three hundred and forty parks, including local favorites San Diego River Park, San Dieguito River Park, and Chollas Lake Park. Additional San Diego attractions include the Museum of Contemporary Art, San Diego Zoo and SeaWorld. All of this plus world-class dining, award-winning schools, professional sports, and numerous luxury home communities make San Diego a coveted address for the elite of Southern California. Among the many prestigious addresses in San Diego, Coronado, Del Mar, La Jolla, and Rancho Santa Fe are among the most well-known. Within these esteemed and distinguished communities you will find luxury homes of all shapes and styles. Whether you are in search of a beachfront, urban or suburban atmosphere, you can find it here. The luxury real estate market of San Diego includes homes with extraordinary special features that ensure a life of supreme elegance. The exclusive properties available in San Diego’s distinguished luxury communities, are sure to impress even the most discerning of home buyers. If you would like more information regarding luxury homes for sale in San Diego, California, please contact us today.